Move is underway in top corridors of power of the Gujarat government to “revive” the high-profile Mandal-Bechraji special investment regions (MBSIR), which houses the proposed Maruti-Suzuki plant, which was pruned to nearly one-fifth of its original size -- from nearly 50,000 hectares (ha) to 10,172 ha. 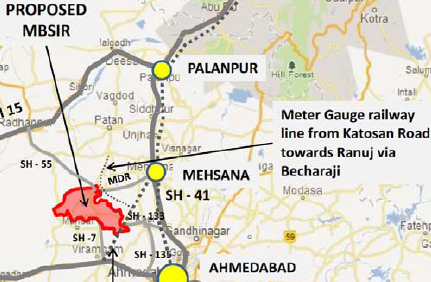 The MBSIR in North Gujarat was proposed a major auto hub. It had to be pruned following a long-drawn-out farmers’ protest last year led by Jameen Adhikar Anadolan Gujarat (JAAG). JAAG has emerged as a powerful farmers’ group campaigning against dozen-odd SIRs coming up in Gujarat. While JAAG has already moved the High Court against the SIR Act, terming it anti-constitutional, sources say, one of the major issues nagging farmers was the government decision to impose the town planning laws on MBSIR. It required farmers to obligatorily hand over 40 to 50 per cent of their land in the name of infrastructure development in the area to the government. Worse, they were obliged to shift to a new area allocated by the government to continue doing farming in future. Well-informed sources quoted a top bureaucrat involved in Vibrant Gujarat investment business summit, a biennial event begun by chief minister Narendra Modi in 2003, to say that the move to downsize the SIR was “electoral”. Sources suspect the government move to “revive” the MBSIR to its original size of 50,000 ha comes because it believes that the elite sections of the region have begun to feel that it was a “mistake” to have agreed to prune the MBSIR. As against 44 villages, the MBSIR was downsized to just eight villages, consisting of Hansalpur (863 ha, where the Maruti Suzuki plant is proposed), Sitapur (3,672 ha), Ughroj (1,424 ha), Ughrojpura (637 ha), Ukardi (856 ha), Shihor (953 ha), Bhagapara (1,243 ha) and Chandanki (524 ha). The sources say, certain sections feel that while the land prices of the eight villages forming the SIR have skyrocketed, but as for the rest, they have considerably gone down, without any signs of revival. JAAG leader Sagar Rabari told Counterview that any move to revive the MBSIR would be fought “tooth and nail.” However, he agreed that there were “fringe elements” in the region which want the SIR to be revived. “There are three category of people who want to revive MBSIR. First are the landowners who have turned into real estate agents. They want to trade in land at a higher price. Secondly, there is the landed gentry which has moved to towns and cities or are living abroad, and are in more in a position to administer the land they possess, hence they want to dispose of their land at as much price they can muster”, Rabair said. He added, “And finally, there are poor people, mainly Dalits and OBC Thakores, who are forced to migrate to other areas of Gujarat every year, as they do not get enough employment in this region”. Meanwhile, a writ petition has been filed in the Gujarat High Court against the SIR Act, saying it contradicts the Government of India’s new land acquisition law, which makes social impact assessment and people’s consent a must for any project coming in any part of India. The Gujarat government has been issued notice on this.